The charming village of Volnay, lying just south of Beaune in the Côtes de Beaune is home to many top producers. The wine made here is red and produced from the Pinot Noir grape. 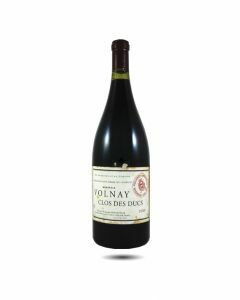 Although there are no Grands Crus, there are 30 Premier Cru which usually mention the name of the vineyard on the label: For example: Volnay-Clos des Ducs. There are five climats that lie across the border in Meursault, known as a white wine appellation. For this reason, these wines are usually labeled as Volnay-Santenots. There are 220 hectares of vineyard in Volnay, with 132 hectares being Premier Cru. Often described as one of the most feminine appellations in Burgundy, the wines have good aromatic intensity, with notes of cherry, violet and red currant. These are wines which can be enjoyed relatively young. They are often paired with game and poultry dishes. A blend of different 1er Cru climats, mainly Les Pitures, this wine has a very expressive bouquet of dark cherries, cassis and a touch of violets; on the palate it is ripe and fruity but with the tell-tale fresh acidity which marks all of these wines. Round and generous in the mouth, very gourmand, this is super Volnay that just when you think that it is very easy drinking, surprises in the finish with a touch of tannin, a bit of minerality and a racy length. This thirty-year-old vineyard borders Pommard and faces Clos des Angles across the road. Located mid-slope it was saved from the late April frosts. The wine is extremely charming with pretty strawberry fruit, perfumes of peonies and old roses and the wine fills the mouth with fresh fruit and acidity; it is so beguiling that it is only at the end of the palate that one notices the finely structured tannins, the tight structure and the thoroughbred breeding in this wine. Lovely intensity.